Dipladenia and Mandevilla are tropical plants with beautiful showy flowers. The blooms can be red, pink, or white, depending on the variety, and will be trumpet-shaped, reminiscent of a hibiscus. Both plants are hardy and perennial to USDA zones 9 or 10 and are popular annuals in northern regions where they can be overwintered. Dipladenia is actually a member of the Mandevilla family. It is widely thought that Mandevilla and Dipladenia are the same plants. While they are similar, Dipladenia foliage is somewhat smaller and the plant is more shrub-like. However, both plants have the same care and growth requirements. These gorgeous vining plants have soared in popularity and can be used in mixed containers, hanging baskets, or in their own in a container. They are easy to grow and should flower all season long. The differences between the two plants begin with the way they grow. While Mandevilla will vine out—sometimes over 20 feet—Dipladenia will be more of a bush, though it may produce a short vine. If you're looking for a trellis or arbor flower Mandevilla is the one you want. For a full patio container or hanging basket that will bloom all summer, go with Dipladenia. There is also a slight difference in the foliage and flowers. Dipladenia have wide leaves that grow into a heart shape and are smooth. Mandevilla leaves are thin, long, and textured. To see the difference in the flowers, you really need to compare the two plants side by side. The shapes are generally the same, though the Dipladenia's flowers will be smaller. Both flowers are attractive to hummingbirds and butterflies alike. Dipladenia and Mandevilla thrive in full sun and moist, well-drained soil. They don't tolerate frost so if you live in a cold-winter climate, it's best to consider these exotic annuals or bring them indoors as houseplants until warmer temperatures return. In warm-winter areas that don't experience frost (or do so only rarely), Dipladenia is an evergreen perennial that flowers on and off throughout the year. Dipladenia and Mandevilla will flower best in full sun—six to eight hours a day—but will tolerate part shade. One of the perks of planting them in containers is the ability to move your plants as needed. If you live in a really hot area, for instance, try moving your plant to a shady spot in mid-day to ensure the leaves don't get scorched. Mandevilla flowers need sandy, well-draining soil with plenty of organic material mixed in. A good potting mix for Mandevilla plants would be a combination of peat moss, builder's sand, and leaf mold. Unlike many flowering plants, Dipladenia or Mandevilla will tolerate some dryness and continue to flower. That said, they prefer a consistent level of moisture and you should try to keep the soil damp, but not wet. When watering, make sure to water slowly to give the soil time to soak up the moisture. When using a hose, spray the leaves too. These plants require warm temperatures and high humidity. Nighttime temperatures should remain around 65 to 70 F. Misting will help keep humidity levels up. Most plants you buy at the nursery have a slow release fertilizer already in the soil. You probably won't have to worry about feeding your plant for the first few months. After that, you will need to fertilize it regularly. You can either use a diluted plant food every other week or add a slow-release fertilizer to your soil. Always follow directions on the package. For a consistent production of flowers, don't transplant your Dipladenia into a container that is too large or it might spend more energy producing roots and top growth than flowers. You may see fewer flowers until the roots have hit the bottom of the pot. If your plant becomes root bound and does need a bigger pot, look for one that is wider, but not much deeper. This will allow the roots new room to grow as needed while allowing much of its energy to be put toward the blooms. Also, make sure that your pot has good drainage. Cut four- to six-inch-long shoots below a leaf node. Remove the leaves and buds from the lower part of the cuttings. Dip the shoots in rooting powder, then place them in the potting medium. Water and cover it with light-permeable plastic (a plastic bag with holes is ideal as it allows ventilation, which will prevent mold) or use a greenhouse. Place the pot where it will get bright light and a steady temperature of about 75 F.
When you see roots in a month or two, you can pinch back new growth to promote bushier growth. 'Rio Dipladenia': Grows one to two feet in containers or outdoors (after frost has passed); produces huge pink blooms. 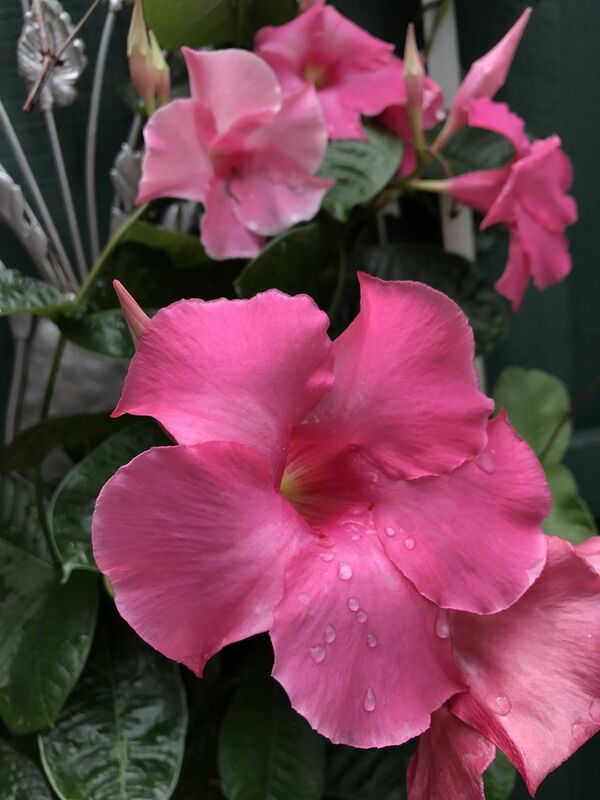 Dipladenia or Mandevilla sanderi 'Brazilian jasmine': May reach 15 feet tall in a garden bed with twining, woody stems, and large pink-red blooms. Mandevilla boliviensis: Native to Bolivia and Ecuador and noted for its white blooms; can grow three to ten feet tall with a three- to six-foot spread. Mandevilla laxa 'Chilean jasmine': In summer, produces masses of heavily scented white flowers; can reach 20 feet when planted outdoors. If you live in a cold climate (anything lower than zones nine through 11), it is possible to overwinter Dipladenia indoors. Take your plant in before evening temperatures dip below 50 F. Place it where it will get as much direct sun as possible (or at least lots of indirect light) and protection from drafts. Stop feeding, and water it less frequently—but don't let it dry out completely. Resume regular watering and fertilizing in the spring. Resist the temptation to cut the plant back or you'll miss out on the next season's flowers. Once nighttime temperatures are consistently above 50 degrees Fahrenheit, you can put your plant back outside. Dipladenis and Mandevilla can attract spider mites, scales, whiteflies, and aphids. If you notice any of these, simply apply an insecticidal soap which will destroy pests without harming your plant. Repeat treatments may be needed. Distinctive brown spots on Dipladenia indicates fungal disease. If you notice that, apply a fungicide (following package directions).